Icegram is free and comes bundled with a range of message types and themes to deliver your messages. You put messages in a campaign, and can control who sees those messages, where they show and when they show. A ‘Message’ is a communication you want to deliver to your audience. And Icegram comes with not one, but four message types. Different message types look and behave differently, but they all have many common characteristics. For instance, most message types will allow you to set a headline, a body text, label for the ‘call to action’ button, a link for that button, theme and styling options, animation effect and position on screen where that message should show. An action bar is a proven attention grabber. It shows up as a solid bar either at top or bottom. Use it for your most important messages or time sensitive announcements. Put longer content in it and it acts like a collapsible panel! A messenger is best used to invoke interest while your visitor is reading your content. Users perceive it as something new, important and urgent and are highly likely to click on it. Want to alert your visitor about some news, an update from your blog, a social proof or an offer? Use Icegram’s unique toast notification, it will catch their attention, let them click on the message, and disappear after a while. Many other message types are available as premium add-ons. For example: Inline messages, Sidebars, full screen Overlays, Exit Redirect confirmations, Interstitials / Superstitials, Ribbons, Stickies and Badges. A campaign allows sequencing multiple messages and defining targeting rules. Create different campaigns for different marketing goals. Icegram supports showing multiple campaigns on any page. You can always preview your campaign to ensure campaign works the way you want, before making it live. Add one or as many messages to a campaign as you want. Also choose the number of seconds after which each message should show up. 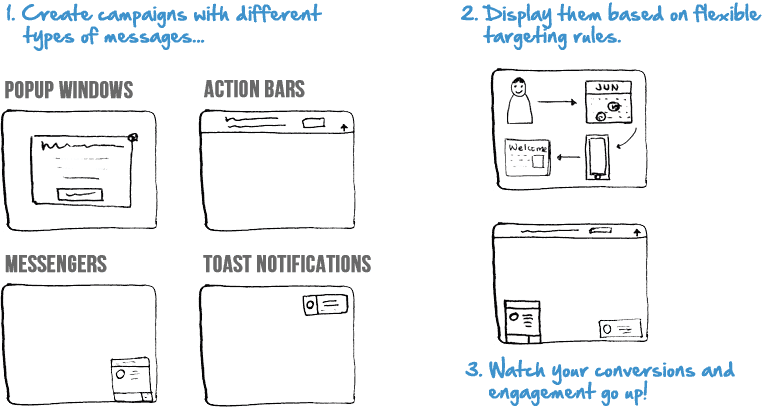 Showing multiple messages for same goal, but with slightly different content / presentation, greatly improves conversions. You can control who sees a campaign – and on what device, which pages does it show on, and what time period will it stay active for. You can run different campaigns with different rules to maximize engagement. We’ve also created premium add-ons for Analytics, Behavior Triggers, Geolocation, CTA Actions, showing Icegram on remote sites and more. You may want to try them out! 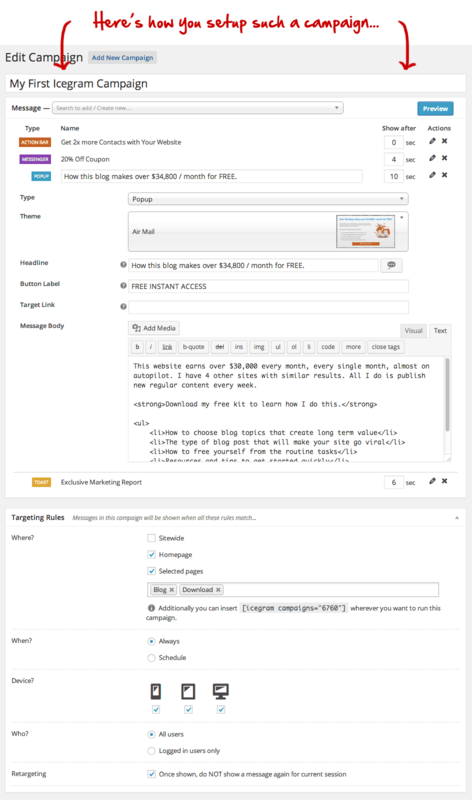 And here’s a screenshot of how you may configure a campaign and messages within. You can embed any optin / subscription form to your Icegram messages using ‘Embed Form’ button above text editor. Paste in form HTML code and let Icegram clean it up! You may even use a shortcode if you are using a WP plugin from your newsletter / lead capture service. How many messages should I show on a page? While Icegram provides you lots of different message types and ability to add multiple messages to a campaign, we discourage you to go overboard. We’ve observed two messages on a page work well, but YMMV! Go to Messages from Icegram menu. Edit a message and translate it like any other post. Icegram will show translated message where possible. Choose All posts under WPML Language setting – Blog Posts to display, to fall back to default language messages. Consider Icegram’s premium add-ons to get even more power and flexibility!